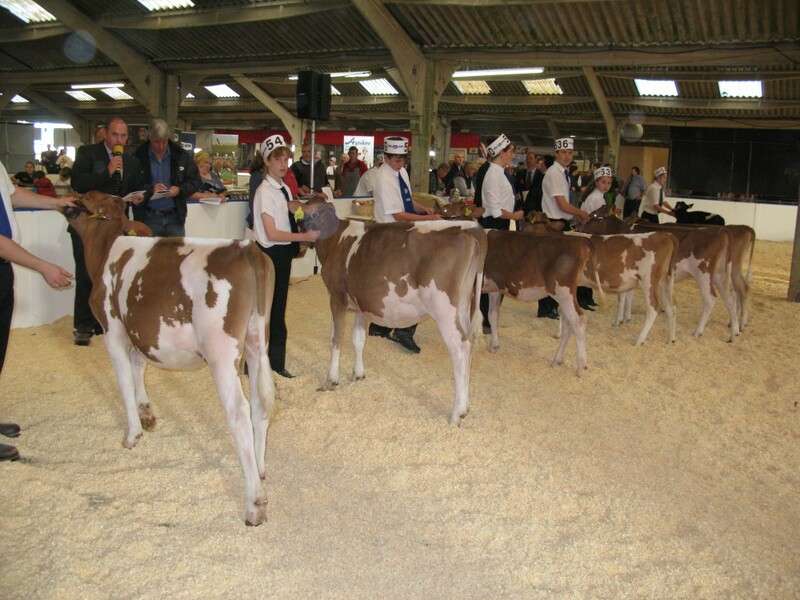 It was my pleasure to judge the calf classes a this years All Britain Calf Show.Five exhibitors had 13 calves forward and what a high standard of animals throughout the classes. The first class was for calves Born after 1st March 2013. This was topped by Mike Moody’s, Latifa Princess Leia by Andante. 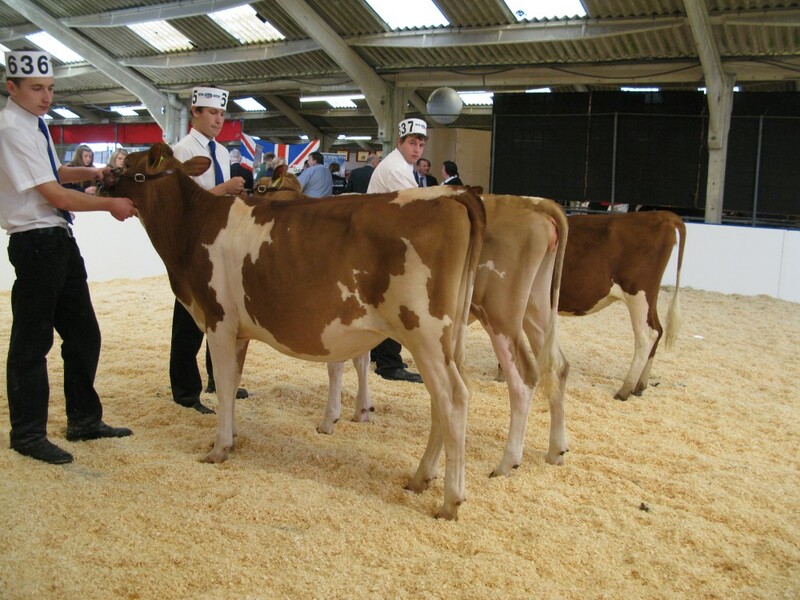 She was a well grown very correct dairy calf who had the advantage over the second placed calf in her superior teat quality. 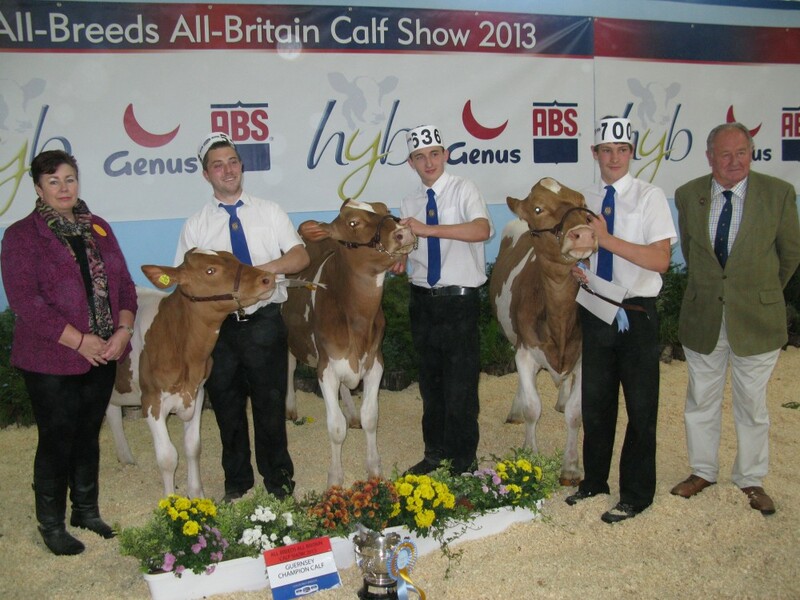 The 2nd placed animal was another lovely dairy calf, Aber Norman Nia from Shannon Daws. Her maturity gave her the advantage over the third placed calf, Kimcote Pride 3 from Andrew Thomas. This rather sweet daughter of Aaron will be one to watch for the future and her overall balance gave her the edge over the other calves in the class. 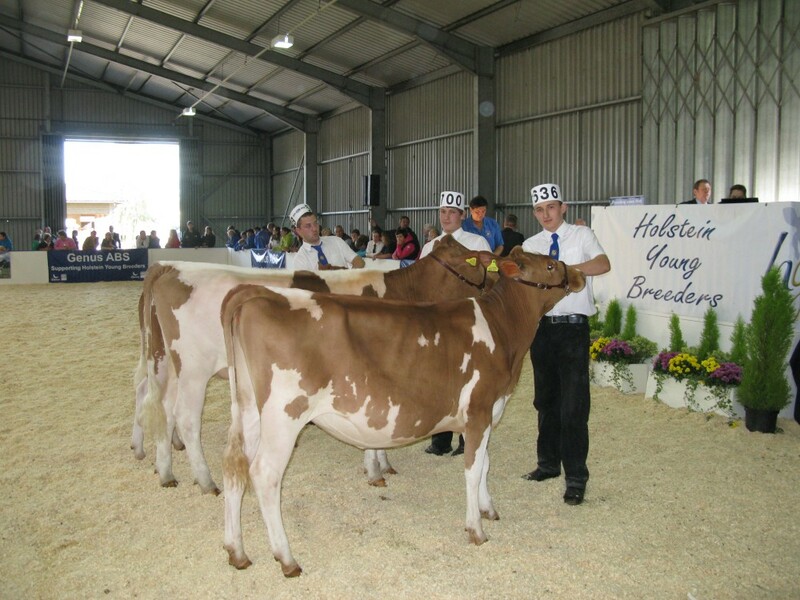 Fourth was Andrew Tilley’s Tregallant Lyndell’s Evelyn, followed by Aber Wesley Violet from Micheal Daws and another calf from Andrew Tilley, Tregallant Prada Jiff. The second class was for calves Born between 1st Sept and 30th Nov 2012. 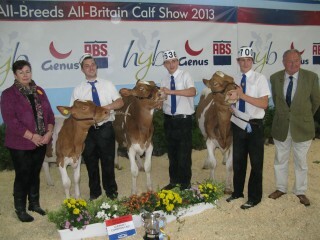 This was won by Andrew Thomas and his calf Kimcote Fragrant 2 by Aaron. This super dairy calf, paraded well and was strong throughout especially over the rump and this gave her the advantage over the second calf, Aber Eric Violet 16. This calf from Micheal Daws had the advantage in her overall dairy quality over the third placed calf from Andrew Tilley, Tregallant Lyndells Dot. The Third Class was for calves Born between 1st May and 31st Aug 2012. This class was won by the very powerful Edgehill Grumpy Holly 2 shown by Micheal Daws. Her strength through the back end when walking, gave her the advantage over the second calf, Kimcote Christine by Aaron’s Crunch shown by Robert Thomas. This super dairy calf just had the advantage over her herd mate, Kimcote Pride 2, shown by brother Andrew , in her overall balance throughout. 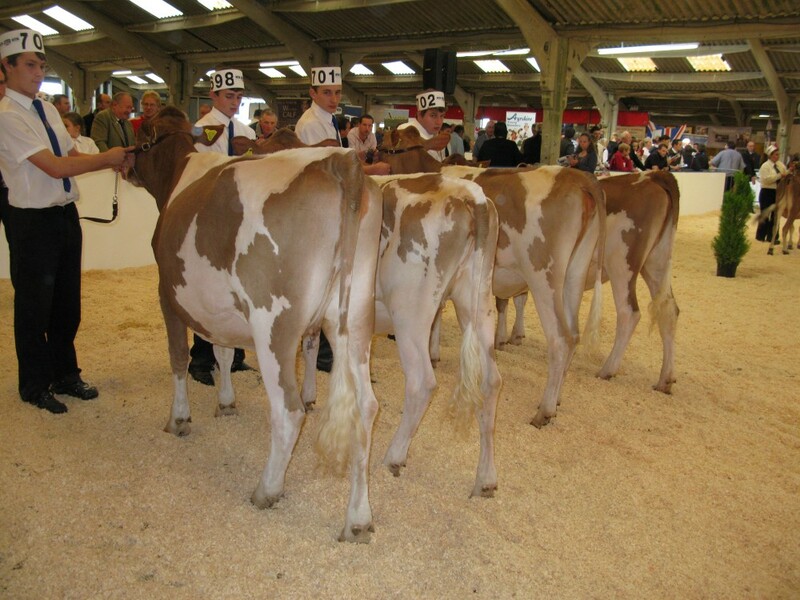 Her dairy quality gave this third placed calf by Royal Delta the nod over Robert Page’s Blanche’s Vendetta Polyanthus, expertly shown by Martyn Dean. In the Championship, I had no hesitation in awarding the top prize to Kimcote Fragrant 2 from the Thomas Family. My reserve Champion went to Edgehill Grumpy Holly 2 from the Daws’ and Hon Mention went to Mike Moody’s Latifa Princess Leia. Thank you to all Exhibitors and Handlers for making the show a success and to Laura and Neil for stewarding. Also thanks to our President, John Berry, for presenting the Championship prizes on the second day.